30 days. That’s how long it’s been since these cute little drums showed up on my door step. Originally intended as a practical little extra kit to bring to jams, the cottage and maybe the odd small gig, it turns out it gets more use than my “regular” drum set. 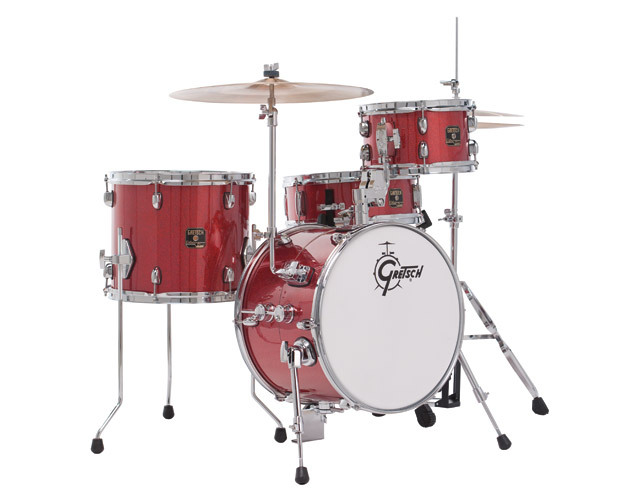 Up until getting acquainted with Gretsch JR, as I call them, I harboured a suspicion towards the various compact/portable drum kits. My suspicion has since subsided and I’m considering getting another small-size setup as my permanent practice kit in the house and simply keeping Gretsch JR in the hockey-trunk, ready for duty at the drop of a hat. I have collected my Experiences, Impressions and Conclusions from the past 30 days in this Gretsch Catalina Club Street Review. I hope you will find it informative and useful. It certainly isn’t easy deciding on a particular kit of the smaller variety. My goal with this review is to provide enough information on this kit for you decide if it should go on your short-list. 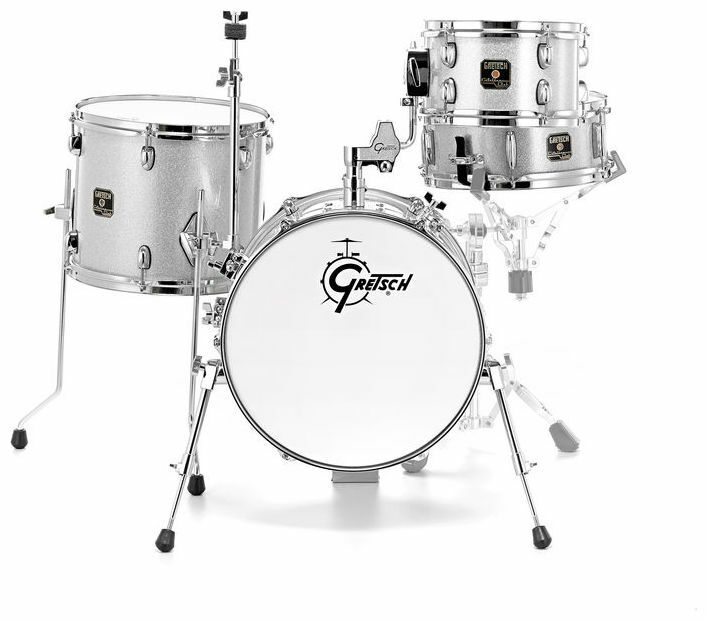 I believe it’s a great choice for me personally, but if it was the ideal choice for everyone, there wouldn’t be any other “shrunken” drum sets on the market. 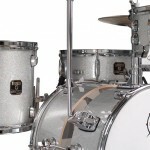 Immediately after unpacking the red sparkle drums I realized that the silver sparkle would have been a better choice. 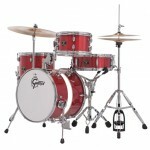 I like plain, subtle and understated but the red sparkle is too subtle for these little drums. silver sparkle would have given them a bit more presence. The wrap itself is of adequate quality and finish although of the thinner variety. 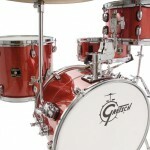 There’s nothing wrong with the red sparkle finish, actually, I would have really liked it on larger drums. 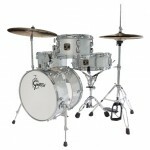 Overall it appears that some of the components are shared with the other drum sets in the Catalina series. Other components are of a lighter, smaller variety but of an equal quality level. This is definitely not a bad thing. Lugs, brackets, and other foundry parts are all of better than average quality and display very nice chrome plating. A couple of details seem a bit odd, like the cymbal mount. 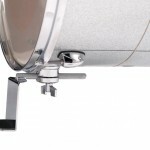 Wouldn’t a “regular” cymbal arm incorporated into the tom mount assembly have made more sense and been a bit more “standard”. The “offset” cymbal attachment does lend a distinct vintage vibe though. The insides of the shells are completely unfinished and not the very smoothest I’ve seen. Not that I expect more from a set in this price range, but maybe some experimenting with finishing the inside would enhance the drums a bit. I’m not overly careful with them but certainly not careless either. So far they have held up very well. I don’t see any signs of wear on any of the chrome, but there are some minor scuffs and blemishes in the wrap. Nothing I wouldn’t expect. Overall the durability seems more than up to the task of a portable drum kit. Construction and design is where it gets interesting. Starting with the unusual way the bass drum opens up. 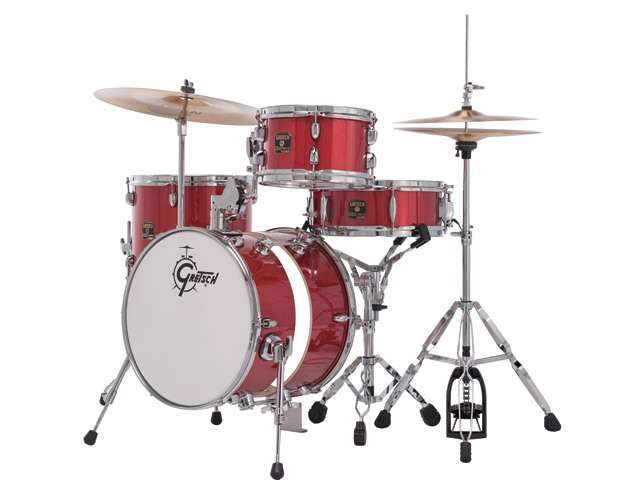 To quote Gretsch; “When the bass drum is “opened up” the drum delivers a robust feel with a focused punch, impressive depth and controlled overtones. 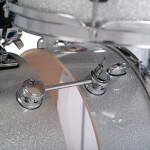 For a more traditional “jazzy” sound with those familiar satisfying overtones, simply close the depth of the drum using the three adjustment rods.” There are little notches in the rods to aid in alignment. The only comment I have on this arrangement is that it sometimes takes a bit of “jiggling” to move the one half along the rods. The offset cymbal arm is already mentioned. The position has grown on me and I quite like the way it looks and places the ride at the perfect spot for me. 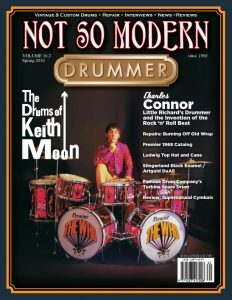 However I wish they would have also kept the tom mount more “standard” to allow the insertion of a cymbal arm there as well. Down the road likely I’ll replace the stock tom mount with a regular rod and clamp-on ball/L-rod assembly. Although the little bass drum riser looks petite and almost flimsy, it’s both solid and sturdy enough for the task it’s intended for. In addition there’s a couple of inches of lateral adjustment available to accommodate for varying pedals. The brackets, tom legs and spurs are lighter and smaller than what is found on the rest of the Catalina line. Although I was suspicious of these at first, they are performing their tasks and holding up to the constant moving around without issues. 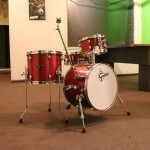 Overall the entire kit is well designed and meets the quality levels I expect from a reputable drum maker like Gretsch. 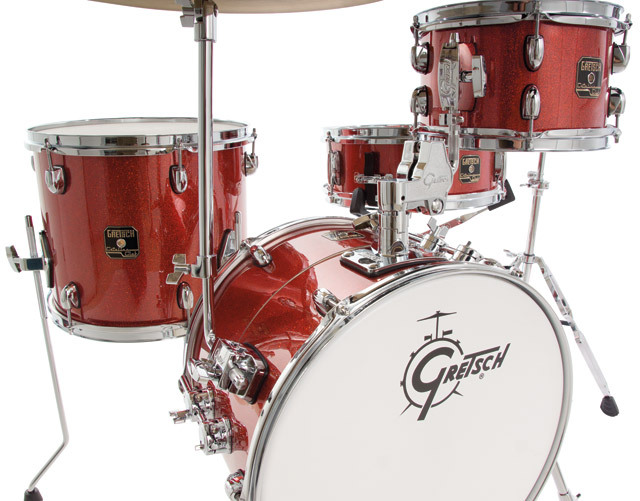 “Gretsch presents the revolutionary Catalina Club Street Kit. 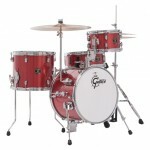 The mahogany shells offer reliable tone and remarkable projection. But what makes the Street Kit unique is its revolutionary “adjustable- depth” bass drum that can be expanded an additional two and- one-half inches in depth, from a 12” x 16” to a 14½” x 16”. When the bass drum is “opened up” the drum delivers a robust feel with a focused punch, impressive depth and controlled overtones. For a more traditional “jazzy” sound with those familiar satisfying overtones, simply close the depth of the drum using the three adjustment rods. 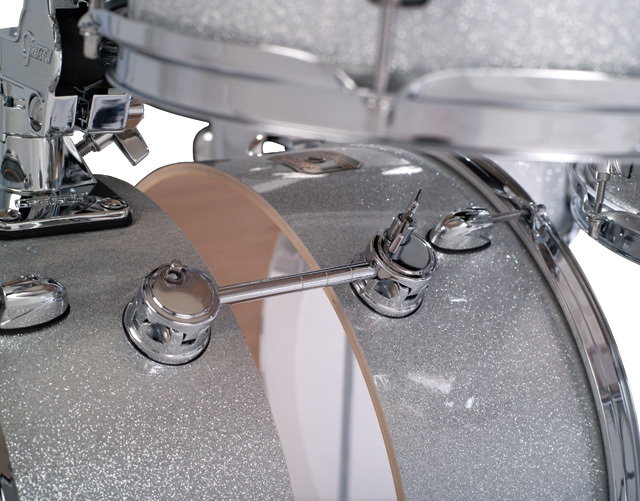 The rods are notched for quick and precise adjustments, making the Street Kit the perfect solution for the player whose gigs vary from one style to another. My “regular” set has a 24″ maple bass drum, tuned low and with a down duvet inside it. The duvet is draped all around the bottom half of the drum and has ample contact with both heads. This gives you an idea of what I consider to be the ideal bass drum sound. It also explains my initial suspicion towards these little “shrunken” bop kits. Needless to say, I’m not expecting to get that same deep and satisfying “thud” from this little 16″ split-shell, sideways floor-tom. I was expecting extensive trial and error with heads, muffling and tuning to get anywhere near an acceptable compromise of punch and volume. As it turns out, not only was an acceptable tone obtainable, it wasn’t nearly as elusive as I thought it would be. Mahogany is a smart choice of wood for smaller shells. I was never a fan of this wood on larger drums as I always found it too boomy and “ringy”. On these smaller drums though, mahogany goes a long way towards providing adequate power while the otherwise too “ringy” sustain (for my taste) is controlled into more of a “punch” in the smaller shells. My ideal setup for the bass drum ended up as a combination of tweaks. I have the split shell about 1/2″ open to reduce “ring”. Each stock head has received a duct-tape X which is applied with 1/4″ ripples” in the duct tape about two inches apart. The X “legs” extend to about 3/4″ of the edge. 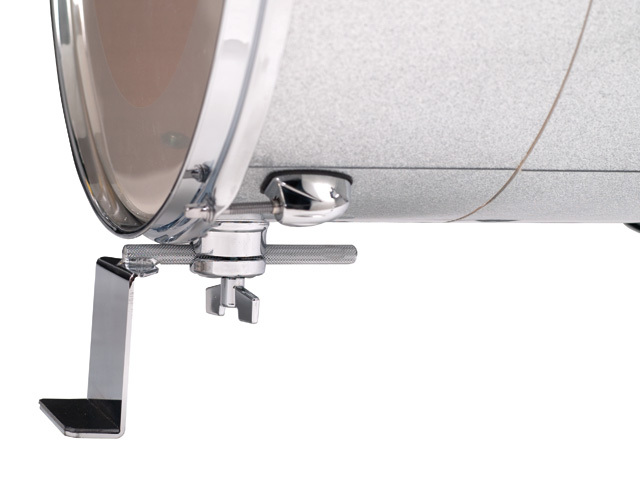 The resonant side head is tuned as low as possible without flapping. The batter head is tuned just a little bit higher. The end result is not as deep and “thuddy” as I’d ideally like, but far closer than I ever would have thought possible without sacrificing volume. Neither of the toms required any additional muffling to provide a matching tone that sounds nice with the bass drum. I can see a jazz drummer really liking these toms as they sing with a soprano voice when tuned high. However for my style I tuned the batter heads about 1/4 lower than the top end of their range and the resonant heads about as low as possible without choking all the sustain out of the drums. Again the stock heads function adequately for my purposes, but once they get a bit more wear I’ll likely switch to slightly heavier batter heads. The snare drum is as expected passable, but no better, or worse than what usually comes packaged with a drum kit priced under $1000. 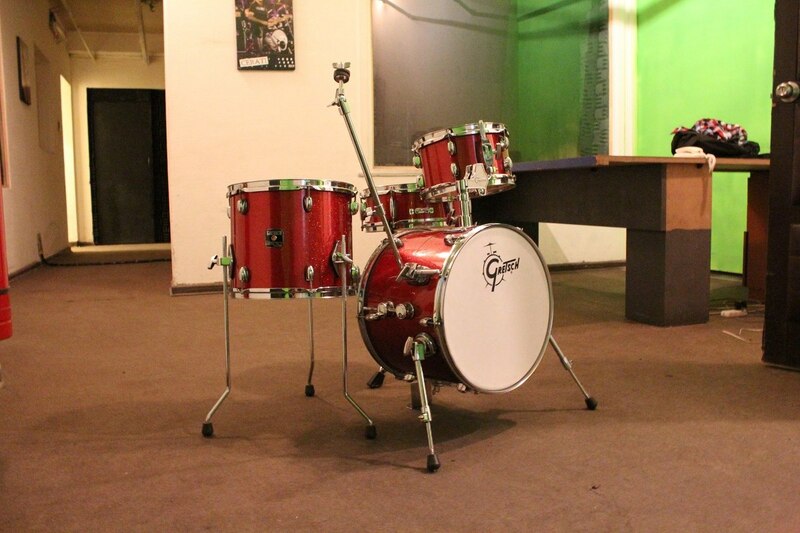 I’ve played the stock snare for one out of three gigs with Gretsch JR. I suspect with a some tweaking it can become quite useful, but for now I resort to one of my other snares if it’s important to create the “right” sound. 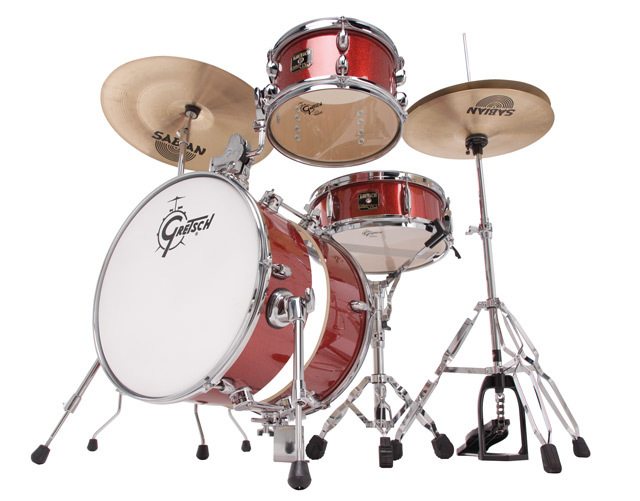 All-in-all my suspicions toward little shrunken drum sets are severely diminished after my experience with Gretsch JR. These little drums have a surprising range and can even be adapted to suit my preferences. The portability is an added bonus and I’m really liking the way a practice setup in the house takes up just a little over half the space that my regular drum set requires. Once I get more used to, and learn more about tweaking a small drum kit, I am confident I can achieve results that will meet the requirements 80% of the time. I’m actually considering getting another shrunken bop kit to become the permanent practice setup at home. This way I can move my regular set to the jam space and keep Gretsch JR. in the hockey bag ready for action. Check the video to the left for a sound sample. many more can be found on YouTube. With a street price of US$650 there are a couple of lower priced shrunken bop kits to compare with, as well as a handful of higher priced. In broad terms, this little Gretsch JR is priced at the same level as the rest of the Catalina line-up, comparatively speaking. 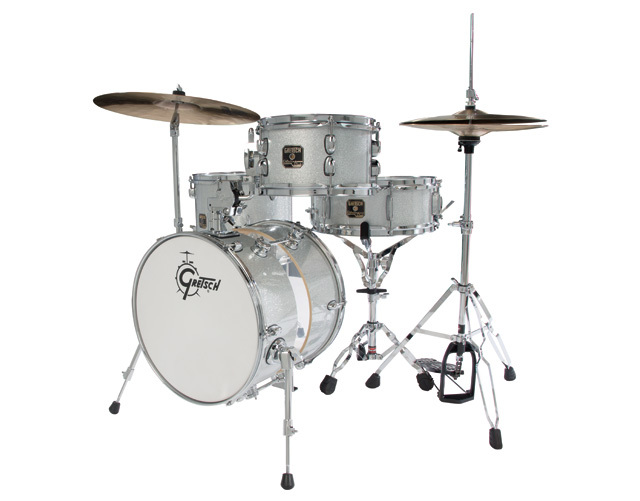 Among the lower priced competitors we find Ludwig’s Breakbeats, Sonor’s Safari and Premier’s MicroBop, we also find the same brand’s “parallel” regular sized kits in a lower bracket than Gretsch’s Catalinas. 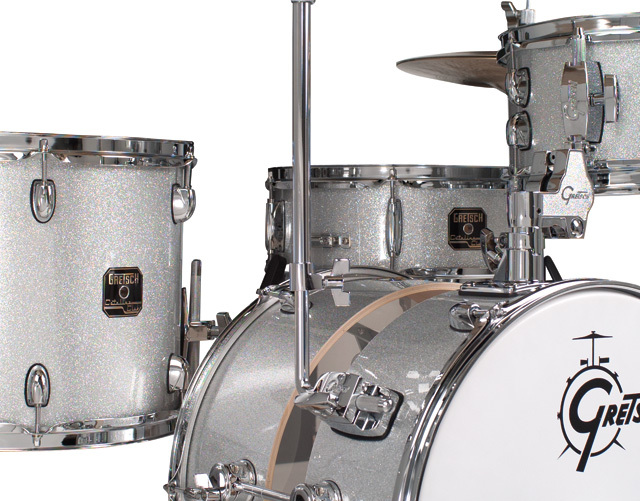 On the same token, the handful of higher priced similar setups, most notably Tama and DW belong to lines that carry a higher pricetag in their respective parallel regular size kits. 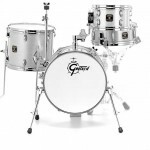 My conclusion would be that the Gretsch Catalina Club Street is priced at a fair level. It’s neither a steal, nor is it a ripoff. 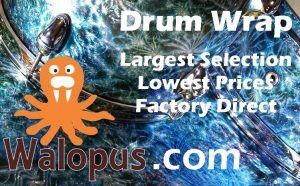 As with so many other products, not just drums, whether it’s a great deal for you, depends how close it comes to being ideally suited for you. I’ll start the conclusion of this Gretsch Catalina Club Street Review with an observation; Going into my experience with Gretsch JR I was expecting to develop a love/hate relationship with it. Loving it for the practical and portable aspects but hating it for the sound and compromise. The fact that this little shrunken bop kit has enough tone and “oomph” to not only break down my resistance and dogma, but even embrace the entire category of portable and compact drum kits, is a testament to it’s abilities. 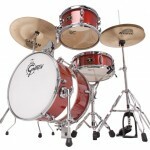 The Gretsch Catalina Club Street has opened my eyes and ears to a whole new experience in drumming. I might even follow some of the other articles on this site and get myself some puny little cymbals or even cobble together a shrunken kit myself.